Recently I've been working to fill in a few gaps with various toy lines in my collection. 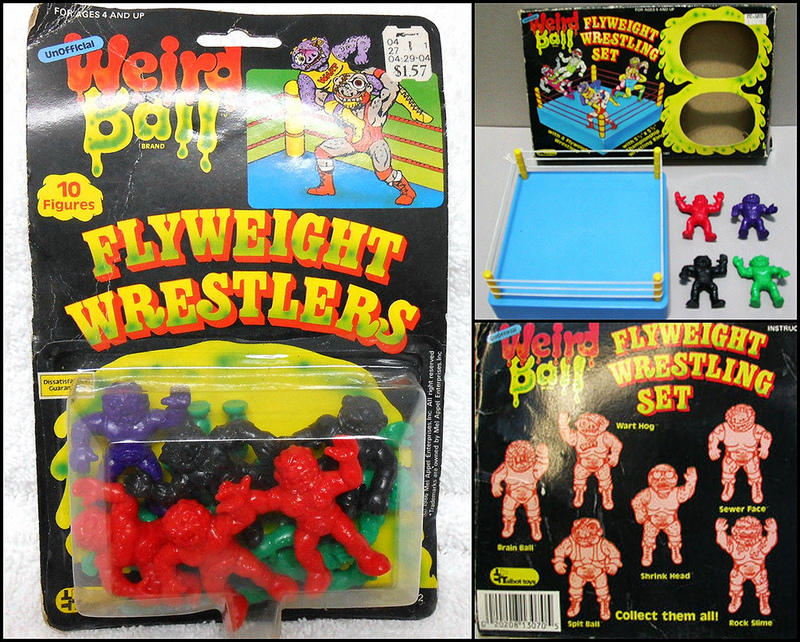 One of these lines is Weird Ball Flyweight Wrestlers, commonly known among collectors as just Weird Ball Wrestlers. 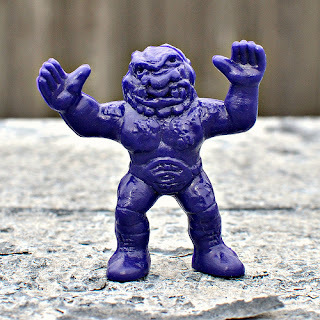 Even though there are only six different sculpts in this line--and they're some of the first mini figures I remember getting new as a kid--up until recently I was still missing a couple of them. I did a really quick post on them when I first started this blog, but now that I finally have all the sculpts it's time to cover these weirdos in more detail! 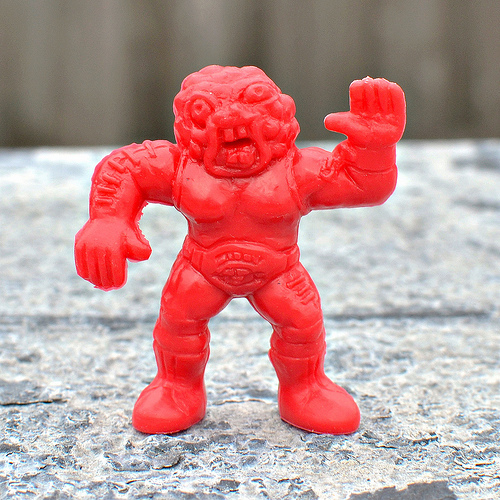 Weird Ball Wrestlers were produced by the Mel Appel Company in 1986 as part of a range of Weird Ball merchandise, including larger rubber monster head balls (basically Madballs knockoffs), trading cards and other figures called "Collectums." 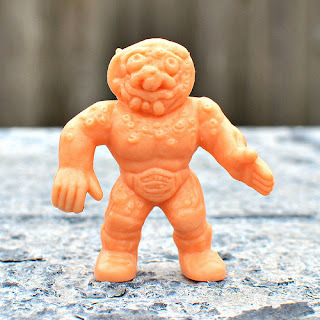 Ahhh, don't you miss the '80s, when everyone was jumping on the gross-out / weird / monster toys bandwagon? The Wrestlers were probably put into the mix as a result of MUSCLE / Kinnikuman figures being successfully introduced to the American market the year before. The feel of the plastic used is very similar to that of MUSCLE. 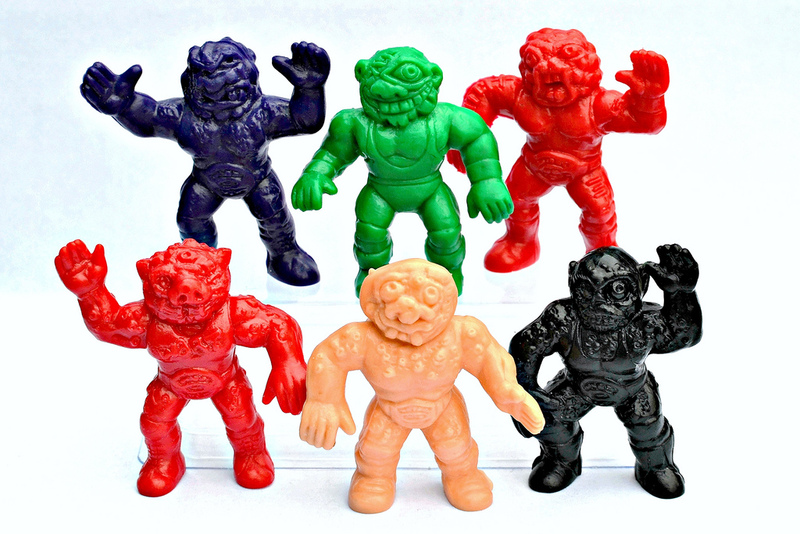 The six sculpts each came in five different monochromatic colors: light flesh, red, green, purple, and black. So a full set of every sculpt in every color consists of 30 figures. 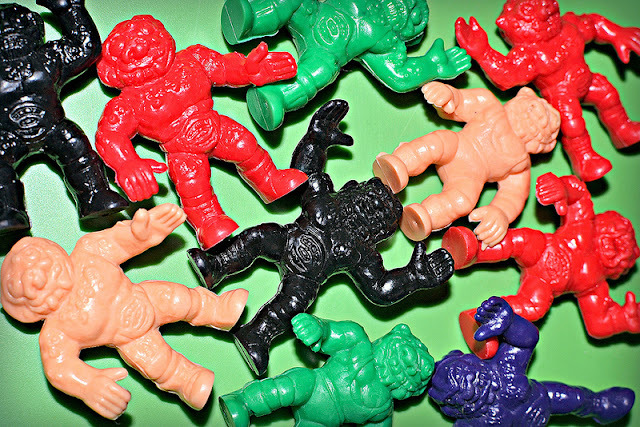 The figures were sold in carded blister packs of 10, featuring bold, colorful graphics. It seems that some packages included only flesh-colored figures and other packages contained a mix of colors. 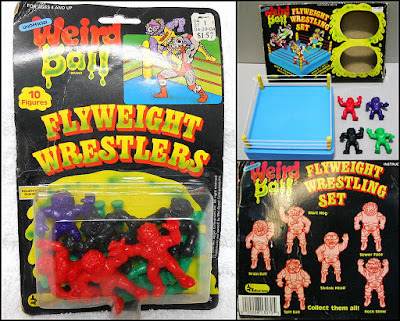 There was also a "Flyweight Wrestling Set" produced which included a wrestling ring playset and presumably, some figures. 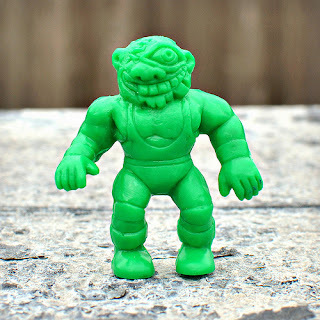 The back of the packaging shows illustrations of all six wrestlers along with their names: Wart Hog, Spit Ball, Shrink Head, Sewer Face, Rock Slime, and Brain Ball. Artwork of four of the characters can also be seen in the Weird Ball trading card set (Rock Slime and Brain Ball are the two without cards). You can see them in this Weird Ball post on MinifiguresXD. 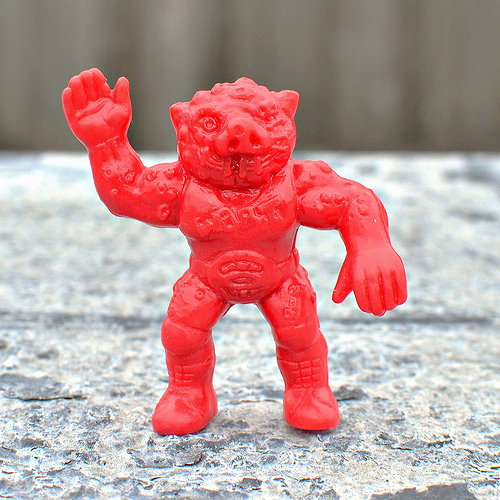 WART HOG (known as Wart Hog Bundy on his trading card) sort of looks like he's giving a friendly wave. Quite the approachable fellow...pay no mind to the pus, sludge and stitched-together mouth. SPIT BALL appears to be gleefully reveling in his herculean performance in the ring. He clearly has his eye on the prize (har har...). His corresponding card shows his full name as Spit Ball Louie. SHRINK HEAD, called Doc Shrink Head on his card, has a ghoulish, ghastly look about him. Dude appears a bit disturbed, to be honest. I guess that's to be expected of someone who likes to spend their time shrinkin' heads. SEWER FACE, a.k.a Sewer Face Sam...well, the name is accurate. This guy was also represented in the Weird Ball Collectums figure line with a different sculpt. ROCK SLIME appears to be the most peeved of the bunch. But with a face that appears to be melting, who wouldn't be? BRAIN BALL is supposed to have a big brain for a head, I guess, but I always thought it looked more like a meatball. Either way, I can dig it. And there you go...more classic gems from the annals of weirdo toy history. 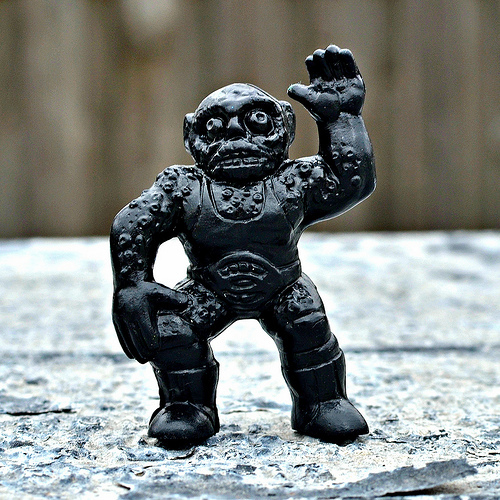 I'm a big fan of the Weird Balls, and wish that Mel Appel would have included more sculpts in the line. What about you? What do you think of them? Do you have any Weird Ball memories? These are cool but I have no recollection of them at all. Shrink Head is definitely kind of creepy, though. I'm digging him! i used to have these my aunt got them for me when i was little. Never really did know the name of them. Great post though.